Buy the Farm . . . Share: Welcome Home, Burgundians! We got some bad news the other day. Our farm share is done for the season. It was supposed to last until late November but, unfortunately, last week's hurricane destroyed all remaining crops. This adds yet another item to our loss sheet and means we need to return to pre-farm share programming. After getting no farm share delivery today I had every intention of continuing my classic beer weekend tonight. A few factors played into this not happening. Firstly, I am kind of sick of having mediocre beers that I haven't had in a decade. Secondly, I didn't want to buy an entire six pack of something like Newcastle. Thirdly, Jen returned early and it was time to return to normal! I roasted some of last week's tomatoes, and charred one of the red peppers over the burner on the stove. 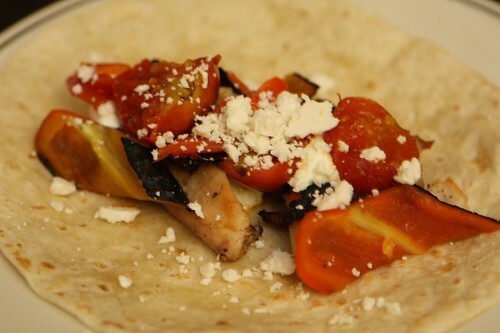 I also heated up some leftover grilled chicken and threw it all on a tortilla with sour cream and cotija. It's not much to look at but it was actually far tastier than it looks or than was expected. 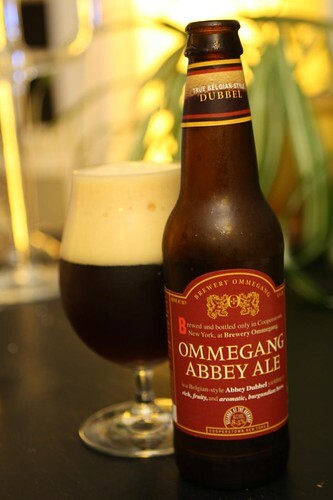 For beer I had this Abbey Ale from Ommegang. I'm a sucker for any beer that has the word "abbey" on the label. I'm also a sucker for any beer that has the word "burgundian" on the label. The only difference with that is that I know what the word abbey means. I don't know what burgundian means. I know there were Burgundian kingdoms in Europe at some point in history. But should that be capitalized? At any rate, these letftovers were lovely. The beer was lovely. And it was nice to have Jen back in the country to share them with. Tomorrow we regroup, begin moving through the remaining farm share items, and start to get back to normal. Except for the lack of farm share.